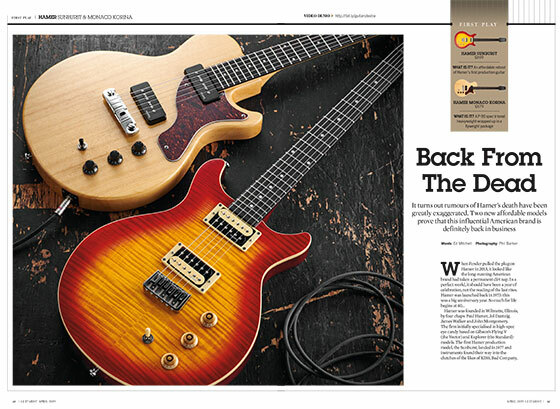 "While we really enjoyed playing both of these born-again Hamer guitars, the Monaco Korina is the one that was toughest to prise from our hands. Yes, the build quality is great, but it’s the lightness on the strap and sweet tones released by the twin P-90s that made it so distressing to put it back in its box. Given its layout and price tag, we can’t think of another similarly spec’d guitar that made us so happy. It’s a real contender." 2018 saw the arrival of two brand new Hamer Guitar models based on sought-after vintage originals, the Hamer Sunburst and Hamer Monaco Korina. Both receive a fantastic review in the new issue of Guitarist magazine, with the latter picking up the magazine’s coveted “Choice” award. "One of the best necks this writer ever encountered was the fat D profile on an old USA Hamer Sunburst. The new Sunburst and Monaco Korina models sport more of a medium C shape that reminds us of the PRS SE ‘Wide Fat’ feel. Anyway, we like the new Hamer shape. Combined with the big rets, shredder-friendly fingerboard radius and the low action, these are some of the most comfortable guitars to play you’ll find anywhere. Upper fret access is boss, too; just look how deep those cutaways are." "Plugging in, the Sunburst reveals an impressive level of sustain. We reckon you can attribute a lot of that longevity to the through-body stringing." "The Monaco Korina is everything you’d expect from a great P-90 guitar. The bridge pickup sparkles with a clean tone and some reverb but goes all Jekyll and Hyde when you wind up the overdrive. Think Johnny Thunders of the New York Dolls. Flicking to the middle position introduces a warm woody element to the tone, while running the neck P-90 solo is where you need to be for your tasteful blues stuff." "So, were we visited by the ghosts of riffage past? Yes, the spirit of the original Hamer classics haunts these new Sunburst and Monaco Korina models. You’re getting some tasty tonewood for your money, and the build quality and playability is as good as anything you’ll find for less than 700 sheets." The full review can be found on the April 2019 issue of Guitarist magazine on sale now. The Hamer Sunburst and Monaco Korina are also available now priced at £699 and £679 RRP inc VAT respectively. Hamer Guitars are distributed in the UK by Sound Technology Ltd. For more information please call 01462 480000 or visit www.soundtech.co.uk/hamer. This cool and lightweight guitar is based on a very limited edition, much-sought-after, Hamer customshop model from 2005. Just like that vintage masterpiece, the new Special K features a solid Korina single cut body and Korina neck with Ebony fretboard and jumbo frets. The two soapbar P90 pickups and wrap-around Wilkinson bridge deliver awarm and versatile tone and all the sustain of much heavier Mahogany solid body guitars. The blending of the materials with Hamer’s brand essence make this model a must-have instrument.